reserved for SC/ST candidates. Interested candidates can attend the walk in interview at CDM & PHO office on 11-12-2018 at 9:00 AM. Application form is available for download Koraput District website of www.koraput.nic.in. Candidates must have known Odia Language. 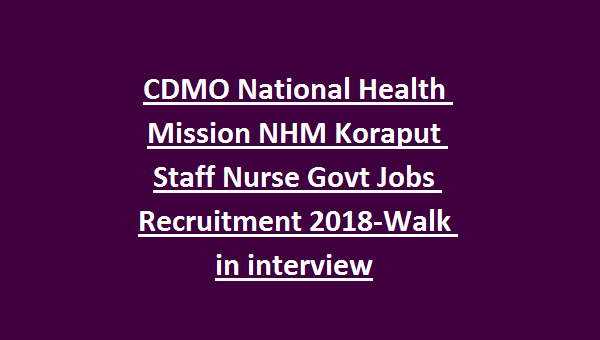 Must have registered with Odisha Nursing Council for this CDMO NHM Koraput District recruitment 2018. 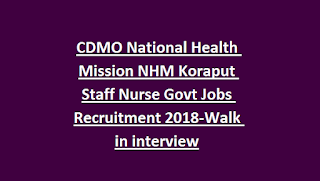 Detail information about this NHM Koraput Staff Nurse vacancies, selection process and more is given below. There are total 30 posts in this NHM Koraput District. As on 01-12-2018 candidates age limits are 21-32 years. For ASHA’s who are having one year of experience in Health system in Odisha State, for them upper age limit is 45 years. GNM Nursing Diploma or B.Sc Nursing qualified candidates are eligible for this Staff Nurse jobs recruitment 2018. Selection will be based on merit in qualifications. Those who are having GNM/B.Sc Nursing they are only eligible for this NHM Koraput District recruitment 2018. Application form is available to download at www.koraput.nic.in.